On the first part of this CD program, which has helped many people shift their thinking patterns when used on a daily basis for 30 days, Louise shows that forgiveness is the key to releasing negative emotions, and resolving diseases such as cancer. On the second part of the program, Louise presents a loving visualization with soothing music, aimed at changing old attitudes of long-held resentment and dissolving disease. This material is excellent for practitioners and therapists who treat people with cancer. Through Louise’s Hay healing techniques and positive philosophy, millions have learned how to create more of what they want in their lives, including more wellness in their bodies, minds, and spirits. Her own personal philosophy was forged from her tormented upbringing. Her childhood was unstable and impoverished, and her teen years were marked by abuse. Louise ran away from home and ended up in New York City, where she became a model and married a prosperous businessman. Although it appeared that her life had turned around, it was not until the marriage ended 14 years later that her healing really began. Louise Hay started what would become her life's work in New York City in 1970. Lousie attended meetings at the Church of Religious Science and began training in the ministerial program. She became a popular speaker at the church, and soon found herself counseling clients. This work quickly blossomed into a full-time career. After several years, Louise compiled a reference guide detailing the mental causes of physical ailments, and developed positive thought patterns for reversing illness and creating health. This compilation was the basis for Heal Your Body, also known affectionately as "the little blue book." Louise Hay began traveling throughout the United States, lecturing and facilitating workshops on loving ourselves and healing our lives. 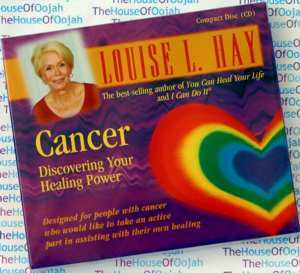 Louise Hay was able to put her philosophies into practice when she was diagnosed with cancer. She considered the alternatives to surgery and drugs, and instead developed an intensive program of affirmations, visualization, nutritional cleansing, and psychotherapy. Within six months, she was completely healed of cancer. In 1980, Louise Hay moved back to her native Southern California, and it was here that she began putting her workshop methods on paper. In 1984, her new book, You Can Heal Your Life, was published. In it, Louise explains how our beliefs and ideas about ourselves are often the cause of our emotional problems and physical maladies and how, by using certain tools, we can change our thinking and our lives for the better. You Can Heal Your Life reached the New York Times bestseller list and remained on it for 13 consecutive weeks. More than 35 million copies of You Can Heal Your Life have been sold throughout the world. In 1985, Louise Hay began her famous support group, "The Hayride," with six men diagnosed with AIDS. By 1988, the group had grown to a weekly gathering of 800 people and had moved to an auditorium in West Hollywood. Once again, Louise had started a movement of love and support long before people began to wear red ribbons in their lapels. It was during this time that she wrote The AIDS Book: Creating a Positive Approach, based on her experiences with this powerful group. Louise Hay now heads Hay House, a successful publishing company. What began as a small venture in the living room of her home has turned into a prosperous corporation that has sold more than ten million books and tapes since its inception. Hay House authors include many notables in the self-help movement, including Wayne Dyer, Joan Borysenko, and Doreen Virtue, among others. In addition, The Hay Foundation and the Louise L. Hay Charitable Fund are two non-profit organizations established by Louise that support many diverse organizations, including those dealing with AIDS, battered women, and other challenged individuals in our society. Louise’s Hay healing message has been the subject of many newspapers and magazine articles.Louise Hay has appeared on television around the world, and her monthly column, “Dear Louise,” appears in more than 50 publications in the United States, Canada, Australia, Spain, and Argentina. When she’s not traveling, Louise Hay enjoys painting, gardening, and dancing at her home in San Diego, California.